Paying for a sandwich will soon be possible via a mobile phone as operator Orange rolls out what it claims is the UK's first mobile payments service. The service, due for launch in summer 2011, sees the phone operator partnering with payments firm Barclaycard. Businesses that have contactless technology include Pret a Manger, Little Chef and the National Trust. More services are expected to roll out in the run up to the 2012 Olympics. The London games is seen as an epicentre for contactless payments, with sponsors such as Visa and Transport for London heavily involved in so-called Near Field Communication (NFC), the short range wireless technology that underpins many wireless payment systems. Consumers can already take advantage of contactless technology in the UK, if their credit or debit card is enabled - designated on Barclaycards, for example, with a wireless symbol. There are already 11.6 million contactless credit and debit card in circulation. Users with a contactless mobile, as with contactless cards, will only currently be able to use them for small payments of up to £15. Moving the experience on to the mobile is something consumers want, according to Jason Rees, director of m-payments at Everything Everywhere. "Studies show that people are more likely to forget their wallets than their mobile phones. Trials have proved that customers love it, they love the simplicity of having their wallet all in one place and it means there is no more need to carry cash," he said. Orange customers of Everything Everywhere will be the first to use the service. The firm says extending the contactless payment system to T-Mobile customers was an "option" open to it. "We want to use the technology for loyalty cards and to get more information, for example, by tapping on a poster," said Mr Rees. In Japan and Korea, handsets have come equipped with wireless payment chips for some years. David Chan, chief executive of Barclaycard's consumer division thinks there is a natural fit between the phone and the wallet. "I believe that future generations will find it surprising that early this century we were still carrying separate items to buy goods and to communicate with each other," he said. A report by the Payments Council, which oversees payments strategy in the UK, said in a recent report that "by 2050, using cash could well be a minority activity". 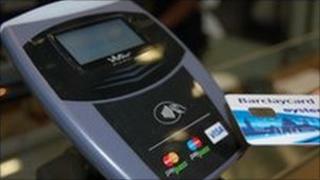 Juniper Research predicts that one in six mobile devices will be contactless by 2014. Ben Wood, an analyst with research firm CCS Insight, predicts that NFC will open up a host of applications, beyond paying for goods. "Payments is going to be the anchor application but you can imagine shops having a NFC sticker which you simply touch with your phone to check yourself into Google or Facebook. Or imagine touching a digital photo frame and being able to transfer a picture," he said. "There are going to be some incredibly cool ways to use it," he added. Many phones already contain NFC technology, including Google's recently released Nexus S. Firms such as Nokia and Blackberry are also beginning to work with the technology. It is rumoured that Apple will also incorporate NFC in its next iPhone. Mobiles signal future of money?